The column contains a correction. In 2015, ITT Technical Institute announced that it had received a certificate of excellence for reducing the rate at which its students defaulted on their loans. The school noted that only 18.7 percent of students who started repaying in 2012 had defaulted within three years of entering repayment—a decline of 3.4 percentage points from the cohort before. This result meant that ITT Tech had little fear of running afoul of federal requirements that can lead to loss of aid eligibility for colleges with default rates at or above 30 percent. However, brand new data on student loan default rates show that the lauded ITT Tech result was a manufactured fiction, with many more borrowers eventually headed on the path to default. While only slightly more than 18 percent of borrowers had defaulted within three years of entering repayment, another 33 percent were either 90 or more days delinquent on their debts or were not paying their loans for reasons other than going back to school or serving in the military. 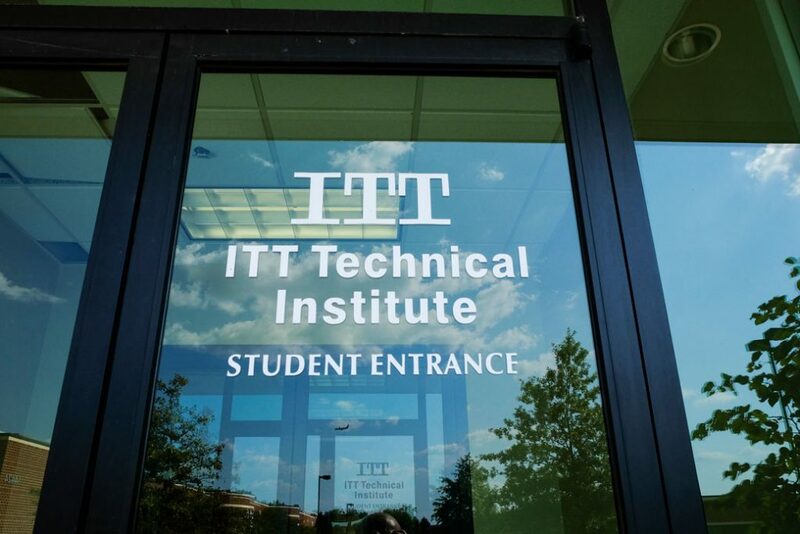 After the official three-year window ended, ITT Tech’s borrower performance declined quickly. A quarter of the school’s borrowers defaulted by four years into repayment. And by the five-year mark, ITT Tech had hit the federal threshold of a 30 percent default rate, with another 20 percent of borrowers experiencing some kind of challenge. In other words, just two years beyond the official three-year measurement timeframe, half of ITT Tech borrowers were either in default or facing loan struggles. Students and taxpayers likely would have avoided significant costs had federal accountability systems been able to properly measure ITT Tech’s loan performance. By 2016, more than a quarter of a billion dollars in loans made to just the 2012 cohort of ITT Tech students was in default. In addition, the U.S. Department of Education estimated that ITT Tech’s abrupt closure in 2016 could cost as much as $460 million in loan discharges. Nearly 14,000 former ITT Tech students are trying to get their loans forgiven. Many of these loans likely would never have been made had robust accountability systems properly caught the company’s outcomes and cut off federal aid. Sadly, ITT Tech is not alone. Many other schools have benefited from a student loan accountability metric that does not track results for long enough and that hides greater problems by only measuring default. As Table 1 below shows, of the institutions that have faced investigations or lawsuits for alleged wrongdoing with student financial aid, many had default rates five years into repayment that would have put them on the path to sanctions if they had occurred by year three. This list is based on a running list of schools maintained by David Halperin at the Republic Report. Even though many schools on this list settled lawsuits, very few of these lawsuits or investigations have resulted in jail time. Furthermore, the institutions have not admitted guilt, instead denying the allegations. The experience of the disgraced Corinthian Colleges was similar to that of ITT Tech. The company—which operated the Everest, Heald, and WyoTech brands before its 2015 closure—had the largest jump in default rates of any of the publicly traded companies that faced investigations or lawsuits. Its five-year default rate was 35 percent, a 16 percentage-point increase. Many privately held colleges that lack the national name recognition of Corinthian and ITT Tech similarly avoided accountability, even as their long-term results would have put them at risk of sanctions. For example, in 2016, Computer Systems Institute lost access to federal aid after the Department of Education found that it had misrepresented job placement rates. The school had an 11 percent default rate after three years; however, by five years into repayment, this figure jumped to 37 percent. Similarly, when default rates were extended two years past the official window, Marinello Schools of Beauty saw its default rate increase from 18 percent to 33 percent. In 2016, that chain lost access to federal aid after concerns about how the school managed the aid programs. When problematic colleges get federal financial aid due to insufficient accountability measures, taxpayers and students face massive costs. The institutions that faced lawsuits or investigations and had five-year default rates at or above 30 percent had 75,000 borrowers in default, who owed more than $800 million. And this figure excludes the many other borrowers whose loans were delinquent or not being paid for reasons other than going back to school or serving in the military. Better federal accountability likely would have saved many of these students from unaffordable loans and a future in collections. To be fair, not all institutions that faced lawsuits or investigations had a long-term default rate above 30 percent. And not all schools with a five-year default rate above 30 percent are for-profit colleges that faced lawsuits or investigations. For instance, some community colleges that had three-year default rates in the mid-20 percent range ended up exceeding 30 percent by year five. However, of the more than half a million borrowers at schools that did not have high default rates at year three but did by year five, 68 percent attended a for-profit college. 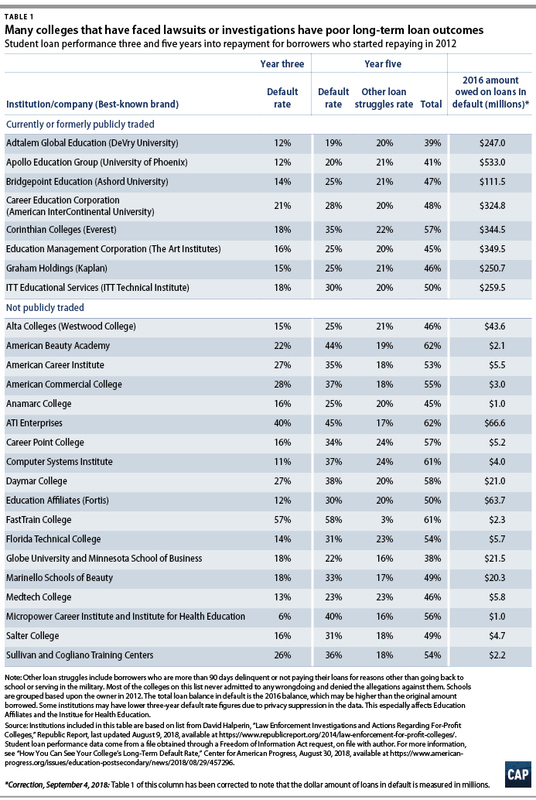 Given that only 27 percent of all borrowers went to a for-profit college, this figure is striking. These data emphasize yet again how insufficient the typical measure of student loan default is at tracking borrower outcomes and holding colleges accountable. This is by no means a unique critique. However, these data show that failing to capture these problems is not just an issue of abstract fairness; real students’ lives are harmed through default. And it all happens outside the light that Congress requires the Education Department to shine on loan outcomes. *Correction, September 4, 2018: Table 1 of this column has been corrected to note that the dollar amount of loans in default is measured in millions.